Yehaw! We're having a barbecue cook off right in my back yard - or practically. Salisbury is hosting a Cultural Arts Festival over the weekend, and tomorrow (Friday May 1, 2009) includes the pig cooking contest. It's quite possible that Salisbury, North Carolina is the birthplace of Lexington-style pork barbecue, although I'm sure folks from over in Lexington will be glad to argue that. The basic story is that Sid Weaver set up shop with a barbecue tent near the courthouse in Lexington in 1909, but John Blackwelder had been serving his chopped pork over in Salisbury from his taxi cab stand starting the year prior. Blackwelder was near Spencer Shops (the state railway hub), and he picked up a lot of business with people passing through on the trains. Of course, people in the area had been slow cooking pork over wood before there were any places selling barbecue. Barbecue was a popular choice for church dinners and political events. It generally had to be a special occasion, because it takes a long time to smoke good pork, and you've got a lot of meat when you're done. In any case, Lexington got the credit for the Carolina cue as reflected in the name. 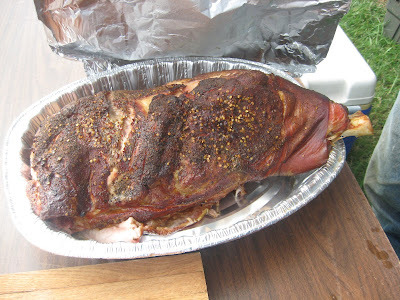 Lexington-style BBQ is the piedmont (or western barbecue) in contrast to eastern barbeque which is whole hog and with no red in the thin vinegar sauce. Piedmont pitmasters typically smoke down shoulders and add catsup or tomato sauce/paste to the vinegar sauce which is tangy with hot peppers and occasionally other spices. If you want to get a heated debate going in North Carolina, just bring up barbecue. You will get an ear full and a lot of suggestions about which style is better and which specific restaurant serves the very best NC barbecue. For a flavor of the South, the festival will feature several barbecue masters ranging from 2 Men and a Grill to the Holy Pig team. If you want to sample all the different barbecues, you can get a sample card for $10. Try out all the pork and vote for your favorite. They'll have a people's choice winner as well as having a panel of judges who will blind taste test the entries. There's also an option to try a single sample for $2, a sandwich for $4 and full plates are available after 5 p.m. for $8. If you miss the festival, there are several great barbecue joints in the Salisbury area. One of my favorites is Richard's Barbecue at 522 North Main Street. My Dad always loved to go there, and the owners and servers are very friendly.